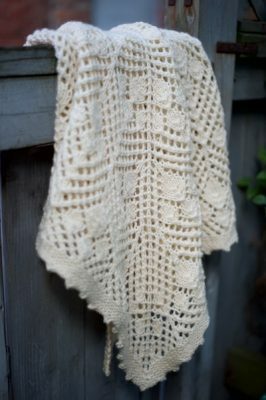 Somewhere – there are some knitters who have wondered how interesting this baby blanket drama is going to get. 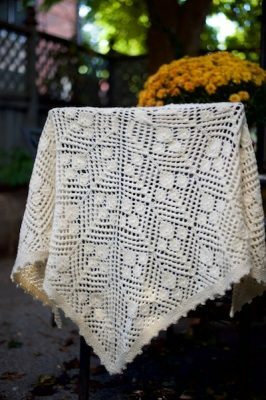 There have been some doozies over the years, so I can see how at this point, the news that a baby blanket was underway would be chum in the knitterly waters for you lot, but here it is – other than not being as far along as I’d like, everything is just fine. 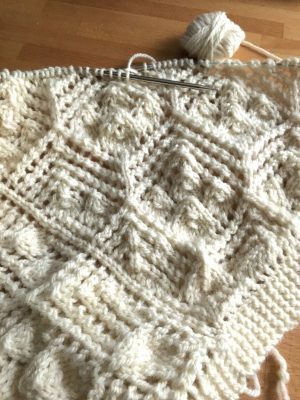 The pattern I figured for myself is working well, I’ve made no major mistakes, I miscalculated on the yarn but I found more, and – get this, those of you who were wondering in which way this thing would get interesting…. that yarn was shipped to me from the US, and in a remarkably efficient display by both the American and Canadian Postal services, it spent forty-six seconds at customs, and arrived yesterday – well in time for me to wind and put it in my suitcase so that I could take it with me to Vancouver this weekend. 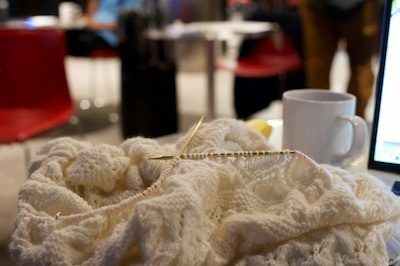 In fact, here I sit, in the airport lounge, headed for Knit City, working away on the thing, and it looks to me like it’s going to come down to a good old fashioned sprint. 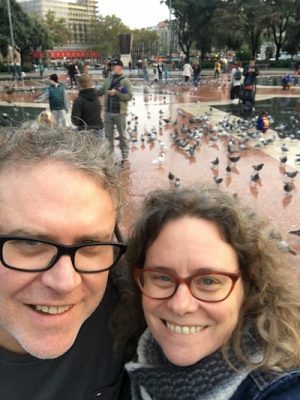 The deadline for this thing is Tuesday – and honestly, I’m not sure I can make it, and for a while there, I wondered how I’d miscalculated so badly. 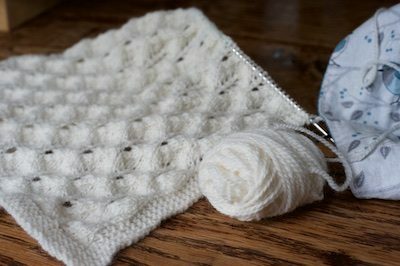 It is unlike me to a) have a drama-free baby blanket, or b) not start one of these things in enough time to finish, and then I remembered. I broke my wrist! I was in a cast! There was drama – heaps of it. It was just quiet, horrible drama rather than entertaining, exciting drama. It explained everything. It’s not that this hasn’t had it’s problems – they were just on the front end. Refreshing, really. Now it’s down to a push to the end – today’s a travel day, and I’m hoping to get through the border, because the edging is enormous. With a little luck, if I apply myself and stay on it, I might maybe, possibly be able to block this thing in my hotel room. I’m charging along at a good pace over here too, I spent the weekend teaching this past weekend at The Stitchery in Rhode Island, and had just the loveliest time, with the bonus of lots of time on planes and in the airport, and now I’ve just about got the middle of the blanket done, which means it’s time to start planning the border. Someone asked me the other day how much planning of these blankets I do before I start knitting, and the answer is “rather less than you would hope.” I do knit a swatch, and I do choose the stitch patterns I’m pretty sure I’ll use, or improvise them, if I can’t find what I like, and I do make charts (I use Stitchmastery these days.) I don’t come up with the exact way that those elements are going to go together – that part’s more… let’s call it loose. When it comes to picking up the stitches all the way around the centre part, I don’t fake it. It’s way too important to get right, so I use the standard formula for figuring out how many to pick up. 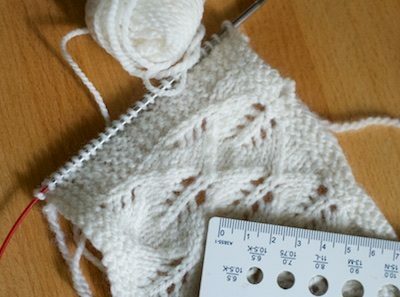 I take my (washed and blocked) swatch, and measure my stitch and row gauge. Lo and behold, it did work. That’s the perfect ratio, that edge lies there as flat as my first catastrophic go at vegan pancakes. 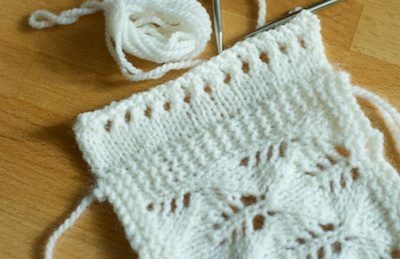 I don’t need to do any stitches along the cast on and bound off edges, because I’ll pick up stitches at a 1:1 ratio there – like always. (That’s the rule. 1:1 for stitches on top of stitches, and stitches/rows for along the sides.) Sometime when it comes up we’ll talk about what I do with a diagonal, but in the meantime, voila. **Stop it. Don’t be superstitious. **Please note that this system, diligently measuring, trying it on the swatch… all of that, is a system that I’ve settled on after a few blankets where I picked up 47465 stitches around the edges of the thing, and then realized after a few heartrendingly long rounds that it wasn’t right, and had to rip the whole thing out amid a flood of tears and whiskey while missing a deadline. 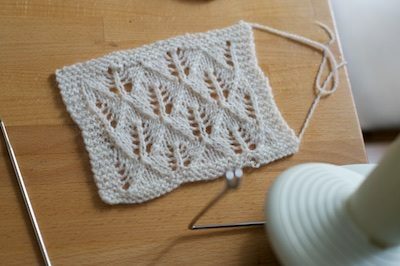 I’m pretty proud that I’ve given up and started doing the swatch and math after only 45 years of knitting, disappointment and sloth. I think I was just excited. 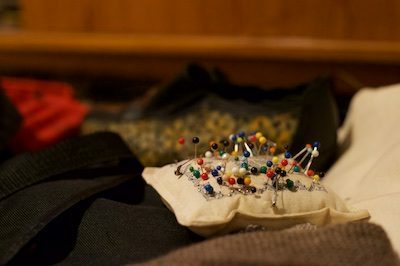 That’s the only explanation for where I find myself – a few days after the cast came off, and in some knitting trouble. 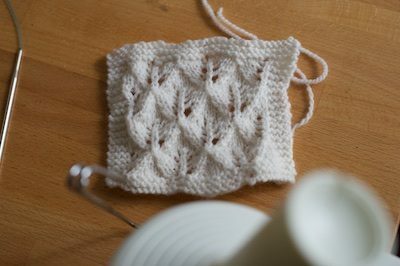 After struggling with knitting for weeks, and only being able to manage big needles and yarn, not only was I really looking forward to pounding out some fine gauge knits, I was behind on an important project. 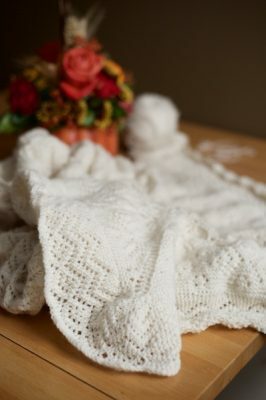 My niece Savannah’s baby will be here soon, and so of course there should be a blanket – although there has already been a sweater, and as I’ve mentioned, this baby’s Grammy will be my sister-in-law Kelly, who is a fine knitter herself. Care must be taken not to bury this wee one in wool, though we can scarcely contain our excitement. Not just a new baby, but a fall/winter baby! While the cast was on, I was planning, choosing stitch patterns, and getting yarn together. I went into the stash and flung yarn around with one hand until I came up with this. I loved it, I cast on…. I knit. 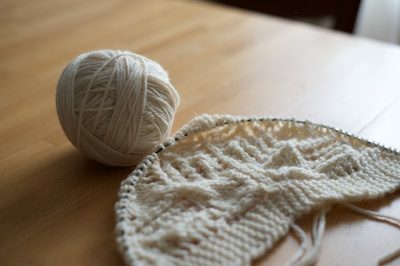 Now I’m about halfway through the body, the yarn is being eaten up at a shocking rate and it is rather completely clear to me that I don’t have nearly enough of this yarn to do what I want. Wait. Let me type that sentence again so that the problem is clearer. 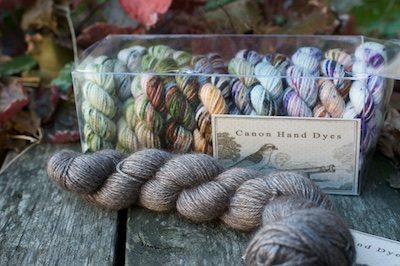 I don’t have nearly enough of this discontinued yarn to do what I want. 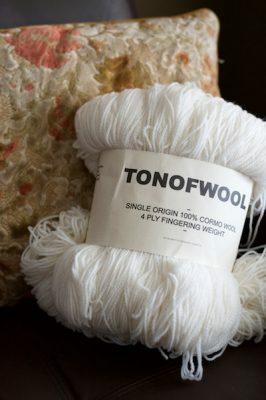 Anybody have some of this yarn kicking around? 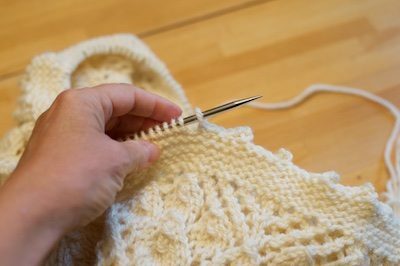 Happily, the title of this post is both a knitting situation, and the current situation of my left hand! 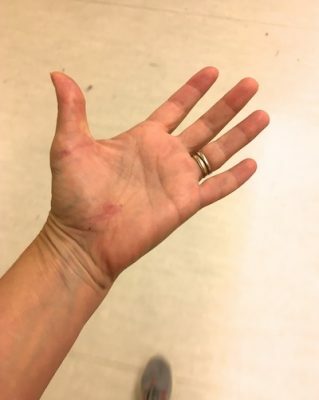 I was at the fracture clinic this afternoon, and the Doctor (who I now find far less annoying than I did a few weeks ago) said that I could do without the cast, and that my hand is now cleared for “light duty”. 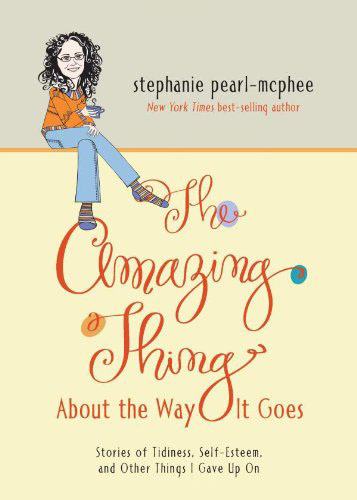 I asked a few questions about what that meant, and while there are definitely still some limits, the big things I’ve been missing are back – typing, and KNITTING. 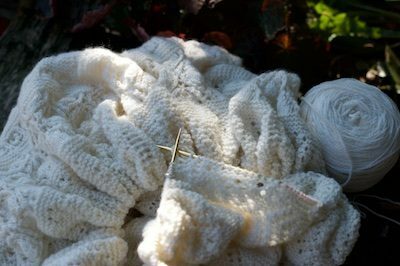 In fact, when I asked him if I could knit (rather “a lot”) he said “please do, as much as you can, it’s good for you.” Knitting is wondrously, finally, as I have always dreamed – doctor’s orders. 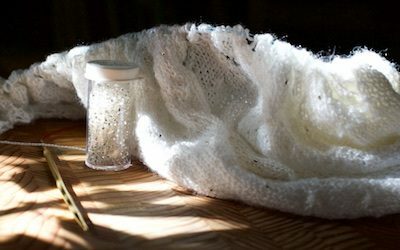 (We will, for the moment, gloss over the difference between what he surely thinks is a lot of knitting, and what I think is a lot of knitting. I feel like if there were limits he would have said something.) I am going to knit, and type and holy cats I think I will eat something you need a knife and fork to manage, and right after that I’m going to wash my hair with two hands, and then I’m going to tie my shoes. Repeatedly. This news couldn’t come at a better time, since this morning I got just about to the end of Love and Darkness, and was (really ironically) finding it really difficult to cast off with a cast on. Let the wild knitting rumpus begin! Sitting across from Jen in the restaurant, she admired the glorious colours of my arm. The bruising is starting to fade, but still impressive. Then Jen looked at me, leaned back and she asked if I could knit. This is a full week after the accident -I think she was afraid to ask me before that, and I get it, I’m a little edgy. I pulled my knitting out of my bag (I’m still dutifully carrying it around, though I can only manage a row or two before I get a weird cramp from holding it strangely) and spread it on the table in front of her. Two more weeks. Back at the fracture clinic on Monday, I’d stomped in with an attitude that I’d hoped would be convincing. I’d tried to sit there looking exactly like someone who should have their cast off immediately, and during the x-ray I’d confidently said “I think it’s going to look great.” When the doctor said that he wanted to leave the cast on two more weeks, I realized my bravado had been a failure. Two. More. Weeks. Sigh. On the upside, today I tied my shoes, and figured out I can drive a car. Presumably, drink other beverages, although I have not confirmed this. Eat things that are small. Text – I got Gboard, and in the one-handed mode I can manage just fine. 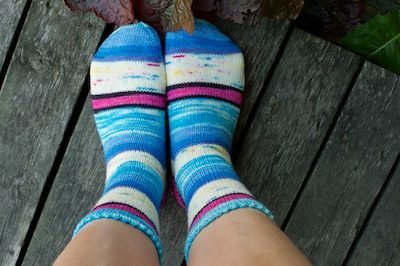 Take pictures of socks you finished right before you went for a bike ride and cast your life into a dark place where you’re making lists about things because you can’t knit socks. 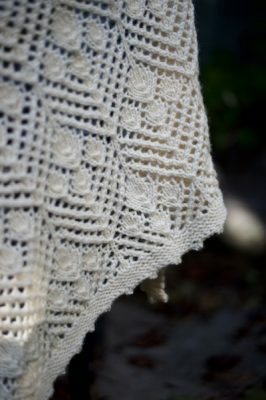 Pattern is Love and Darkness, yarn is Fleece Artist BFL Aran. Laundry. (If you kick the basket down the stairs, which absolutely works, and is satisfyingly destructive and loud. Our laundry is in the basement, so I get to heave it down two flights. It’s totally worth picking it all up again. Hand wind a ball of yarn. Get ice cubes out of a tray. Use a pepper grinder or a salt mill. Open a zip lock bag. Refrain from near constant foul language. Do anything I want to.